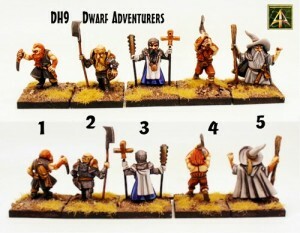 Alternative Armies released a new set of Dwarf Adventurers over in their webshop. Get your Dungeon Crawl and Oldhammer on! Dwarf Adventurers are released at Alternative Armies. Project Darkhelm continues. DH9-01: Dwarf thief with Dagger. DH9-02: Dwarf hero with Halberd in plate armour. DH9-03: Dwarf cleric in plate mail. DH9-04: Dwarf beserker with axe. DH9-05: Dwarf wizard with staff. These miniatures are not supplied with bases and are supplied unpainted. Select your choice from the drop down product menu. Choose from a pack, three packs with a 10% saving applied and single miniatures. Total choice! Have a look and thanks everyone.